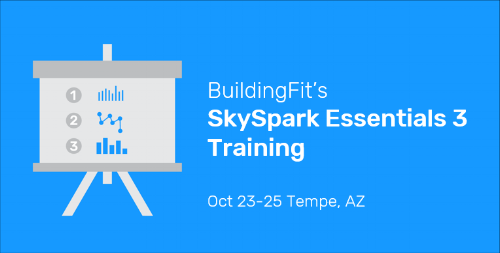 BuildingFit is Hosting a 3-Day SkySpark Essentials Training! The "SkySpark Essentials" training program provides students with the essential information to start to use and implement SkySpark. It is an in-person, three-day session presented in a classroom setting. Training begins at 9AM and ends at 5PM each day. Lunch and snacks are provided. Discounted room rate is available until October 1st: Link will be sent upon registration. The training program consists of 5 Modules, each of which builds on the knowledge acquired in the previous Module. A brief description of each module is provided in SkyFoundry's SkySpark Essentials 3 Overview. *Completion of Module 1 provides an understanding of the capabilities, features and use of SkySpark. This session is strongly recommended for technical salespeople, and is required for students that will participate in additional training modules 2, 3, 4 and 5. It provides the essential understanding of the features and capabilities of SkySpark Apps needed to take advantage of the additional training sessions. It is also the core material typical end users need to know to use SkySpark. Jay Herron is a widely respected member of the SkySpark programming community. Over the past four years, he has been an integral part of the BuildingFit team, coding countless sparks, creating custom fantom apps and unique integrations and flexing his math muscles on novel analyses.